For 15 years, I have dedicated myself to Art. These works are worlds where anyone can enter and be a part of it. Through my work, I want to give people a window to their inner self and escape their everyday life. Harmony is something I try to convey in my art. I believe that nature is perfect: colors, proportions, shapes, functions. So instead of trying to recreate it, I try to create a harmony that complements the perfection I feel in a specific moment. 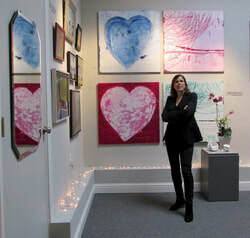 In San Francisco, I exhibited my art in various galleries and in prestigious places. My paintings are scattered everywhere in the world (Italy, France, USA, Spain, Switzerland, Belgium, and Singapore). I hope people in Europe will also enjoy my work.